Unfortunately, fewer than 5% of average Canadian adults (from 18 to 50 years old) get enough fibre from food1, and most them get only about half the fibre they need, which is about 25-38 grams of fibre per day for adults2.Upping your fibre intake can be tough, especially if you’re used to a diet comprised of lots of refined and processed foods. However, with a little planning, you can easily increase your fibre consumption to close the gap. Instead of a plate of bacon, jump start your day with a bowl of oatmeal or other high-fibre cereal topped with fruit. Skip those chips and dips. Keep hunger away with raw veggies like carrots and hummus, a handful of nuts, air-popped popcorn, or yogurt topped with a high-fibre cereal. Eat more whole fruits instead of drinking fruit juices. Without fruits’ fibre and skin, juices lose many nutrients, including antioxidants and fibre. Look for ingredients marked “whole” as in whole grains. Check products’ nutrition facts panels for fibre content. 2.5 to 4.9 grams of fibre per serving is considered a good source. 5 grams or more is considered a great source. Choose whole grain products over processed and refined foods such as white bread, white rice, and pasta. Add some zest to salads, soups, and stews with seeds, nuts, and legumes. Have at least one fruit and/or vegetable with each meal. Go vegetarian for at least one meal per week. Fibre supplements come in many different forms, such as powders, capsules, and snacks, making it easy to consume additional fibre throughout the day. 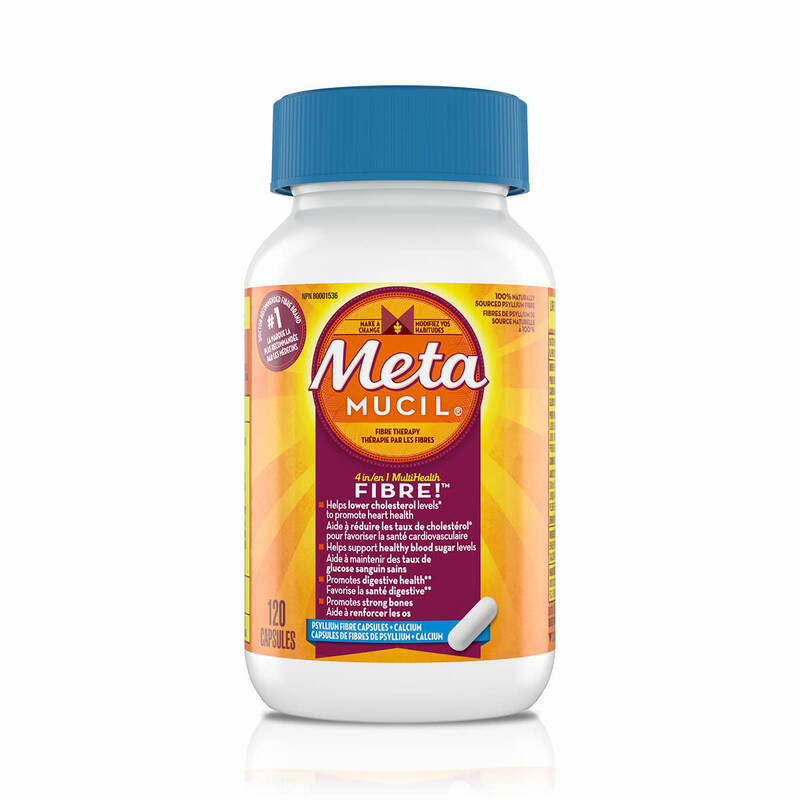 Metamucil Powder, Metamucil Capsules and Meta Fibre Bars are a great place to start.